There’s a creeping monster that most everyone faces everyday, a sneaky beast that hides in plain sight. “It’s a relatively new problem in the scope of human evolution,” said GUNNAR Marketing Manager RJ Snyder. I had sat down with him to ask a simple question: Why GUNNARs? What sets these glasses apart from the cheap yellow-lenses that you can get in any gas station? The conversation began with talking about our eyes. The world has recently been beset by blue light from screens, which is what Snyder was talking about when he referred to this new problem. Staring at a screen causes a number of problems, from eye strain, to dry eyes, and even an inability to sleep effectively because of exposure to blue light. If you’re reading PlayStation LifeStyle, chances are you stare at screens for a significant amount of time yourself. I know I’m looking at a screen for 90% of my waking hours, whether it’s work on the laptop, playing games on my TV, or looking at my phone. I also know that I’ve suffered from many of the problems that Snyder describes. Unfortunately, they become the status quo and are a bit too easy to ignore. We’re not going to stop looking at screens anytime soon, so GUNNAR glasses step in to help mitigate the problems as much as possible. GUNNAR computer eyewear works because of patented lens tech that allows them to be specifically optimized to target the issues. “There are patents on multiple elements of the lends,” Snyder tells me. The amber lenses, that yellow hue you see when you look at a pair of GUNNARs, blocks 65% of the blue light from entering our eyes. That artificial blue light is responsible for eye strain, reduced clarity, and headaches. It also impacts our melatonin production, directly affecting the ability to sleep. It also causes retina damage, cataracts, and ruins our ability to focus effectively. You might be thinking to yourself, “But I can get any old yellow lenses to block blue light. Why do I need GUNNARs?” Remember that GUNNAR lenses are patented, “precision formulated to block harsh blue light.” There’s a pretty big difference between slapping some yellow tinting on some glasses and backing your product with science. 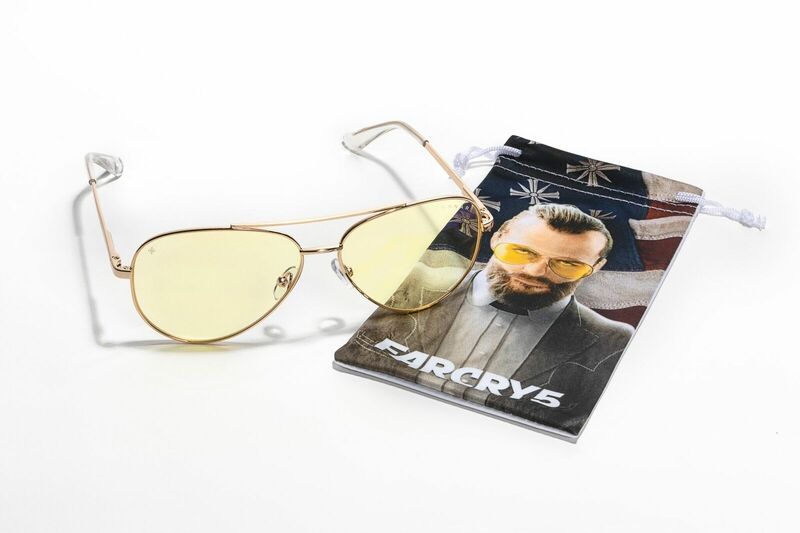 The color yellow is just the beginning though, the most noticeable aspect of GUNNAR computer glasses. There are a few more subtle design specs that come together to create their lens tech. The lens are curved in such a way that they reduce air currents around the eyes, relieving dry eye. Lens material is designed to be hyper-clear, reducing the fogginess found in other lenses. There are additional tint options, including clear for people who need color accuracy and sunglasses for use outdoors. They’ve also got a protective outer coating that reduces glare and protects the lenses from scratches. Don’t take my word for it though. GUNNAR has a full in-depth rundown of the patents and technology found in their lenses on their site. “The amber tint is what people see,” Snyder said, “So that’s what stands out, but it’s all of those elements.” Everything works together to create the computer eyewear that is scientifically backed and doctor recommended. There’s also a “hidden” feature of the glasses, which is a very slight magnification of the lenses caused by both the curvature and the lens material. This feature helps to prevent the need to squint to see things like text on a screen, preventing constant eye strain. I’ve browsed GUNNAR’s site in the past, and I’ve always been curious what creates the difference between different frames? Am I somehow getting inferior glasses if I choose the $50 pair? Is it worth forking over $90 for the “better” options? The short answer is that money speaks strictly to fashion. You’ll still get the same functionality out of the glasses, whether you buy the pricier option or not. “Frame styles cater to different individual’s personal sense of style,” Snyder told me. “Everyone’s face size and structure is different.” Having a large variety of styles allows GUNNAR to serve a wider variety of clientele, whether they are Twitch streamers or the Vice President at a Fortune 500 company. Every pair of glasses is good for close-up viewing of phones and computer screens, as well as casual gaming on a TV. The gaming style glasses do offer some additional features for gamers, including thinner frames that remove distractions from the peripheral vision, and better headset compatibility. There are also the sunglasses for outdoors use and prescription lenses, which are more expensive, but in terms of frame styles with the amber lenses, your price differences are pretty much all about style preference. GUNNAR started in 2008 and has been working to innovate on the patents and technology in their lenses. Just earlier this year, they created the crystalline clear lenses the reduce a lower amount of blue light, but retain the rest of their patents. They’re constantly working to improve the tech, with ambition to create clear lenses that can block even more of the harmful blue light without the amber tint. It all comes back to that unique problem that’s new for humans. We don’t fully know what kind of long-term effects screens and harsh blue light will have, but research shows that it’s causing more harm than good. “Everyone needs protection from blue light and relief for digital eye strain,” Snyder told me at the end of our chat. “GUNNAR is committed to providing solutions for every pair of eyes.” That’s how they plan to save the world: two eyes at a time. 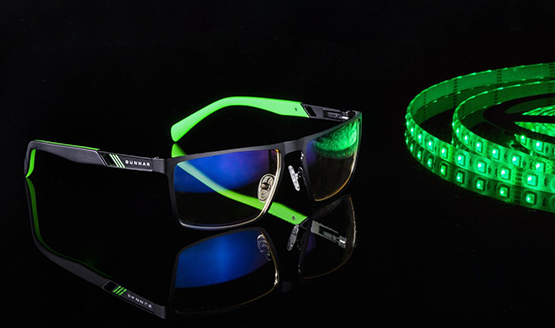 We’d like to thank GUNNAR Marketing Manager RJ Snyder for taking the time to talk to us about GUNNAR gaming glasses. Be sure to check out our GUNNAR computer glasses review after a week with the Vertex frames.